Let the sewing begin! I was so excited to get going on my sewing projects! Today I made window valances for the nursery. This is a fairly simple project and great for a novice like me! It will help warn me up for the harder things to come! Sewing Tip: It is always a good idea to wash the fabric before starting your project. Just like new clothes, new fabric will shrink during the first wash. This isn't as important when making curtains, but will be important when I make my crib sheets and changing pad covers. Step 1: Decide how large you want your valance or curtain to be. 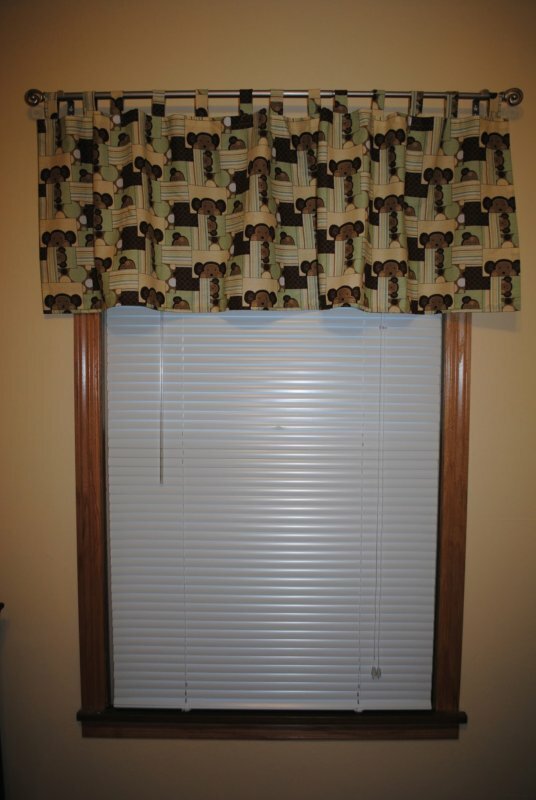 I am using a 40" rod and want my valance to be a bit bunched. I decided on a 57" width and 17" height. Add 3" to each dimension for hemming. I cut two 60" x 20" pieces. You also need to cut the strips for the loops that will hang from the rod. I cut 26 strips that were 2 3/8" x 6 1/2". This will give be loops that are approximately 1". Step 2: Prepare the loops. Take the 26 pre-cut strips and fold them in half on the short side with the back of the fabric out. It is a great idea to iron these down to keep the fold in place. Sew down the non-folded edge. Once all the strips are sewn you can turn them right side out (this can be a little tricky if you are using smaller loops.) I ironed the sewn strips again so they will lay flat on the rod. Step 3: Hem the large pieces. I prefer to fold the edges over twice to make a cleaner look. Fold the long sides first, iron and pin them, then stitch them down. Do the same on the short sides. I ended up with 3/4" hems. Remember to add more than 3" to your dimensions if you want larger hems. Step 4: Attach the loops to the top of the valance. Fold each sewn strip in half and pin to the back of the valance. I found it easiest to start with one on each end. I then matched up the loops to find the center and attached one there. I continued this until I had all of the loops evenly spaced. Then you can stitch them in place. I stitched a simple square. Step 5: Make sure to trim any of the extra thread and they are ready to hang up! I bought an adjustable metal rod at Menards that matches our door hardware. The brackets were easy to attach to the wall and I was done! I am very happy with the result! 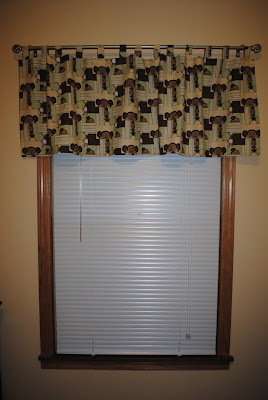 A simple project that adds style and softness to you windows. Once again this was a fairly inexpensive project. I got all of my fabric for 50% off and thread is super cheap! Total for valances was about $4.50 each. The rods cost me $9 each for a project total of $27. Not too bad! I hope this inspires you to take on you own sewing project. My journey has just begun and I can't wait to share my next adventure! My mom and I just made a valance the other day! Your valance looks quite a bit cuter, but hey, I was just proud to have crafted something. You will have one adorable nursery by December!